The Bridgestone B330-RXS golf ball is one of the newer additions to the B330 range and has been welcomed by weekend golfers and social competition players alike. Like all of the B330's, the B330-RXS is a golf ball which offers tour like characteristics and is crafted from only the highest quality materials. The cover of the golf ball is made from soft urethane which creates a huge amount of greenside spin. The core of the golf ball is soft and maleable and this allows the B330-RXS to compress and provide players with moderate swing speeds maximum compression. This results in longer and straighter drives off the tee. The B330-RXS is a great golf ball for many low to medium handicappers. The ball creates a large amount of spin yet has a core which is soft enough to compress even at medium impact speed. Because of this, many golfers are finding that the B330-RXS suits them perfectly and addresses a gap in the market. Around the greens the B330-RXS is responsive with the wedges and from the bunker. Due to the ultra soft urethane cover a large amount of spin is possible and many golfers are finding that the B330-RXS is perfect for their short iron shots. Players who enjoy using the Callaway Tour Is, Titleist Pro V1X, Titleist NXT Tour and Taylormade Penta should try the B330-RXS as the ball is perfectly suited to this company. At Lost Golf Balls each of our golf balls are hand sorted to ensure quality. 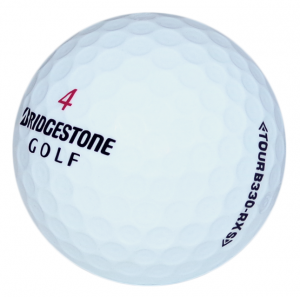 Bridgestone B330-RXS Golf Balls: Tour Like Performance The Bridgestone B330-RXS golf ball is one of the newer additions to the B330 range and has been welcomed by weekend golfers and social competition players alike. Like all of the B330's, the B330-RXS is a golf ball which offers tour like characteristics and is crafted from only the highest quality materials. The cover of the golf ball is made from soft urethane which creates a huge amount of greenside spin. The core of the golf ball is soft and maleable and this allows the B330-RXS to compress and provide players with moderate swing speeds maximum compression. This results in longer and straighter drives off the tee. Basic information of the B330-RXS - Urethane cover - Soft Gradational core - 330 dimple design - 3 Piece The B330-RXS is a great golf ball for many low to medium handicappers. The ball creates a large amount of spin yet has a core which is soft enough to compress even at medium impact speed. Because of this, many golfers are finding that the B330-RXS suits them perfectly and addresses a gap in the market. Around the greens the B330-RXS is responsive with the wedges and from the bunker. Due to the ultra soft urethane cover a large amount of spin is possible and many golfers are finding that the B330-RXS is perfect for their short iron shots. Players who enjoy using the Callaway Tour Is, Titleist Pro V1X, Titleist NXT Tour and Taylormade Penta should try the B330-RXS as the ball is perfectly suited to this company. At Lost Golf Balls each of our golf balls are hand sorted to ensure quality.